Wild rice, also called “Indian Rice” is the seed of an aquatic grass. Much like whole grains, it contains protein and is high in many vital minerals. 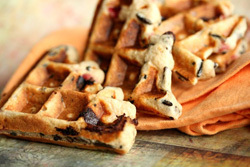 As part of a recent post on Slashfood, I developed a recipe for Wild Rice Waffles. Wild rice looks fancy – its wonderful texture and color make it a food fit for celebrations, traditionally used for holidays – and often has a price to match. It takes about 20 to 30 minutes longer to cook compared to short-grain brown rice, and some of the kernels will break open and “butterfly” when it’s ready to eat. Keep an eye out when it’s on the stovetop – it typically needs more cooking water than most package instructions indicate, so have an extra cup handy.